86 incidents are listed. Data from NOAA Office of Response and Restoration. Thanks for that link. I’ll add it to my site and credit yours. I did notice that even though there are a few large spills, most of them are smaller. 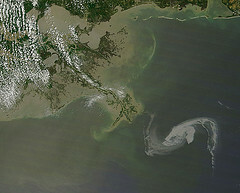 As a 30 year resident of the area, I do wonder what kind of long term effects we’re looking at here in southeast Louisiana because of this spill. Whatever they are, it doesn’t look good.